One of the first things I did when I bought my house was to begin my loft conversion. I devoured every book I could find on the subject of lofts, and having worked for a specialist conversion company for several years I knew the attic was large enough to get a good size double bedroom up there including room for three fitted wardrobes. Whilst I could of squeezed in an en-suite bathroom, I chose to have a large spacious double bedroom instead of a reasonable one with a small bathroom. I've all too often seen people try and fit too much into a small loft conversion before and it becomes too cramped and almost unusable. Sometimes as they say, less is more. It's important to keep it all in proportion, if designing a small loft I think more about how practical I can make the design than how much I can cram in. Once I had thought about all the different attic ideas I could use and designed the space, I then notified the local planning authority. They confirmed what I had hoped - that I didn't need planning permission to convert my loft as such, because it fell within 'permitted development rights'. So, I did the attic conversion on something called building notice instead. For light (not to spy on the neighbours) and access, the first step when building a loft conversion is to install Velux windows and a small pitched roof dormer. One of the Velux windows had to be installed at a set distance from the gutter to comply with the building regulations at the time (so a fireman can reach you), which have since changed. Now you will more than likely need either fire/smoke alarms in all hallways and habitable rooms or to change all your existing doors that access those areas from the corridor to 1/2 hr fire rated ones when having a loft conversion. Whether you are considering a DIY attic conversion like I did, are a homeowner considering employing a company or are a carpenter looking to move into this area of work, making the right decision will be easier after reading the information here. 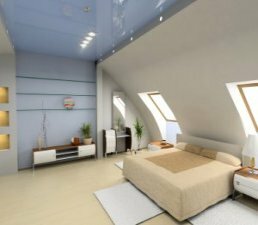 Attic conversions have become big business over the last twenty years or so with lots of specialist loft conversion companies starting up, and it's clear to see why. Most homes and bungalows in the U.K. of three bedrooms or more have a loft space above them that can be converted into a substantial living space. More often than not it is a large area of the house being completely wasted, and only used for storing things like suitcases, Christmas trees and spiders! In many cases, up to 30% of the floor area of the house can be achieved up in the attic area. That's a huge potential gain for a growing family, in a space that's just waiting to be utilised. Is a loft conversion a better investment than moving house or extending? In the majority of cases, the answer to that is Yes. Whilst not always the case, generally the cost of a conversion is usually far better value than moving, adds more money than an extension and costs less than the value it adds to the property. In the current financial climate, with banks operating more stringent lending criteria, unsteady house prices and the threat of a 'double dip' recession many people are choosing to improve their homes instead of to move. There are many large costs associated with moving house. Before you even factor in to the equation the funds required to upgrade to a larger home there are surveys, estate agent fees, solicitors, removal companies, mortgage brokers and stamp duty that all need arranging and paying for. Add to that the endless viewings until you find a buyer and the inconvenience that is caused when a chain falls through and you can soon talk yourself out of all that hassle. Attic conversions are also better in many ways to say, a single storey extension for example. Because of recent changes to planning laws, unlike with an extension that requires a homeowner to go through a lengthy and often stressful planning process you can often extend your living space into the roof within something called "permitted development" meaning no planning permission is required (There are lots of exceptions to this including dormers, conservation areas and listed buildings. Always check with your local planning department and never start work until you have any required permission in writing). And unlike with an extension, building a loft room won't eat into and reduce the land or garden around your home either. It's no wonder more people than ever are choosing to take advantage of low interest rates and convert their existing loft spaces instead of moving house. A good quality loft conversion blends naturally into the home, doesn't feel like an add on and looks as though it has always been there. This is achieved by making sure the staircase is designed so that it flows from the existing stairway and the newel posts, hand rails and spindles line up with and match what is already fitted in the house. Equally important are the other details like all the new windows, doors and ironmongery (handles etc) for example. These must match as closely as possible with the existing, along with decorative mouldings such as architraves, picture rails, skirting boards and stair parts. Older homes such as Victorian and Edwardian properties will most likely have stair parts that are not available off the shelf and will need to be manufactured especially. This is fairly straight-forward using a machine called a copy lathe. How much does it cost to convert your attic?